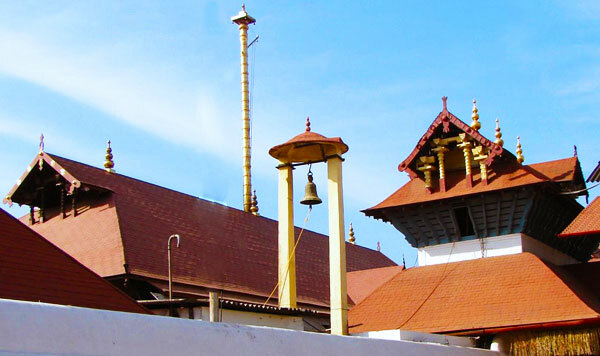 Guruvayoor Sri Krishna Temple is located in a small town of Guruvayoor which is located at a distance of about twenty nine kilometers from Thrissur. The nearest railway station is Guruvayoor while the nearest airport is located at a distance of about seventy five kilometers in Cochin. The temple is dedicated to Lord Krishna whose idol is engraved with pearl necklace and adorned with basil leaves. 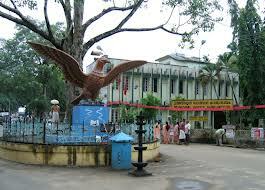 Guruvayoor was a sacred place selected by Lord Vishwakarma where he built this magnificent temple. The spot was considered sacred since, this was the place where the brotherly prince known as Pancetas, received blessings from Lord Vishnu to get the title of Projapati. However, the temple was unknown for many years. King Parishit, son of Abhimanyu died due to a sting from a very dangerous snake known as Takshaka. In order to avenge the death of his father, Janamejaya, performed various rituals which would kill all the snakes in the nearby area. The yagya was very difficult and was known as Sarpasatra. However, this yagya could not kill the Takshaka, since it was immortal (had drunk the Amrit). However, the snake got angry on knowing the intentions of Janamejaya and hence cursed him of leprosy. Janamejaya tried hard to rid himself of the disease but failed in all attempts. It was then that the sage Dattatreya informed him to search the temple of Lord Vishnu and worship him, which was the only way to help him get rid of this dangerous illness. And that is how the temple was found. 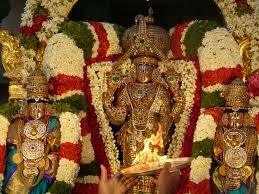 The temple is amongst the five famous temples dedicated to Lord Krishna in India. The temple is considered very sacred along with the waters in the nearby tank. As per legends, the water has some magical powers which help to cure leprosy and other rare skin disease. A dip in the holy water rids one of all the evils. Further, it is also believed that Lord Krishna grants wishes to his devotees who perform the rituals adhering to the norms. 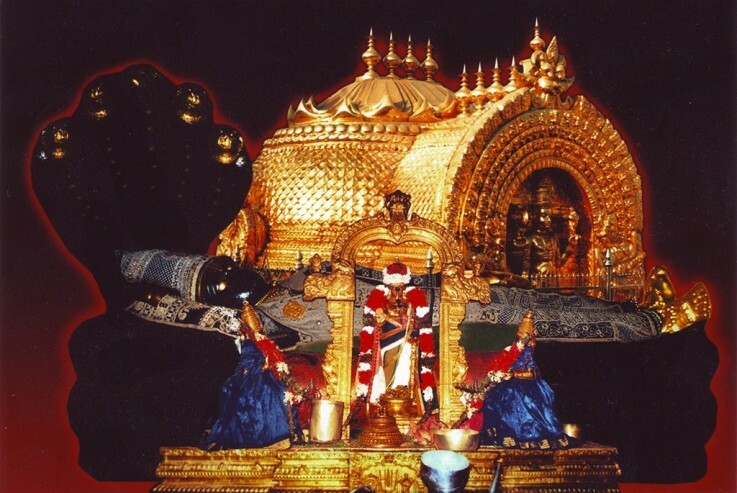 The unique feature of this temple is that the main idol of Sri Guruvayoorappan is believed to be built of black antimony which is a atone having special medicinal properties. Further, every morning the idol is oiled with tin oil and then a mask of vaka- prepared by special powdered herbs is applied over it. Then the lord is bathed with the water. 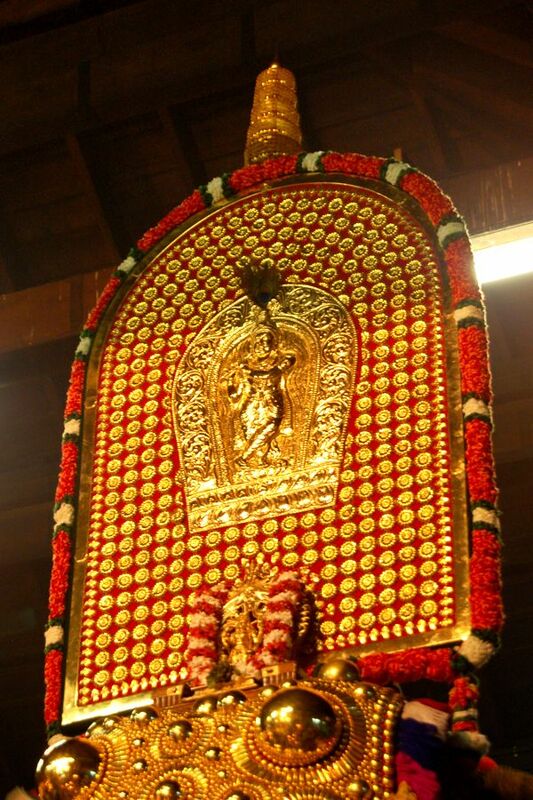 The water that drips down from the feet of the lord is considered very sacred and devotees drink it as prasads. The water is also believed to cure rare skin diseases. Sri Krishna Janmasthmi and Uttam festival which lasts for about 10 days are the two important festivals which are observed here on a grand scale. Events are organized and rituals are performed all day long. Visitors and devotees throng the place to worship the lord. 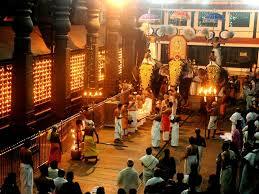 Other noteworthy festivals celebrated here are Vaishaka and AshtamiRohini.